Search Bounce-Fun.com – a USA inflatables rental directory. Do you own an Inflatables Business? The Bounce-Fun Directory has been developed by a lead-generation internet marketing firm with many years experience in inflatables industry advertising. Having developed thousands of websites, and hundreds of website industry directories, we have the programming and design search knowledge on how to achieve great results marketing bounce house businesses, FECs, and kids party venues via the web. Don’t hesitate to activate a listing in the Bounce-Fun website directory today. 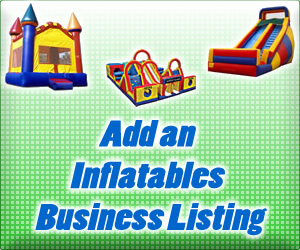 Your Bounce-Fun activated listing includes a bright colorful image or logo from your business, all of your contact info, links Icons to your social media accounts like Twitter, Facebook, YouTube, and more, a description of your business, equipment, and any deals you offer, and every listing includes keywords you would like your business to be found for Add an Inflatables Business Listing .